Hemantha Kuruppu, 41, in Kathmandu, Nepal, where he has been granted refugee status by the United Nations. Last year he was refused entry to Australia and repatriated to Sri Lanka. Kathmandu: Nine Sri Lankans repatriated by Australian authorities last year after their boat was intercepted off Christmas Island have been recognised as refugees by the United Nations in Nepal. Hemantha Kuruppu, 41, says he was overwhelmed with relief when he received news on January 1 that the UN Refugee Agency had finally granted formal refugee status to him, his wife and three children. “Since I made the decision to leave Sri Lanka, I have been through so many hardships,” Mr Kuruppu, a former Sri Lankan public service officer, told Fairfax Media this week. “Why did the Australian government refuse to listen to us? Early on the morning of June 12 last year, Mr Kuruppu and his family pooled their resources with his then business partner, Janaka Athukorala, 40, and his wife and two children, and boarded a fishing vessel they believed was bound for New Zealand. Two weeks into the journey, with the boat low on fuel, food and water, all 41 passengers aboard were picked up by the Australian Navy and transferred to a Customs and Border Protection Service ship within sight of Christmas Island. 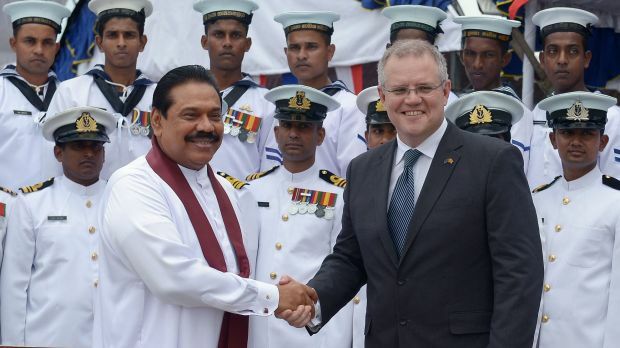 Each of the passengers had their refugee claims assessed via satellite phone by Immigration Department officials in Canberra before then immigration minister Scott Morrison finally negotiated their return to Sri Lanka. Several days after Mr Kuruppu and Mr Athukorala and their families arrived back in Sri Lanka, they told Fairfax Media that the main reason they fled Sri Lanka was because they had come into possession of an important archaeological text that many believed could guide readers to the buried treasure of Sri Lanka’s ancient kings. The treasure map, Mr Kuruppu said at the time, had been so sought-after by rival criminal gangs in Sri Lanka that his life had been threatened several times and he believed that the only way out was to flee the island. Several weeks later, Mr Kuruppu, Mr Athukorala and their respective families contacted Fairfax Media again, this time in the Indian capital of New Delhi, and arranged a meeting at the city’s Indira Gandhi International Airport. At an airport terminal coffee shop, Mr Kuruppu and Mr Athukorala, who had been partners in a construction supplies business on the coast south of the Sri Lankan capital Colombo, detailed how they had been able to call in several favours with various government officials who were able to supply them with new passports and visas to both India and Nepal. Acting on advice from a prominent Colombo-based human rights lawyer, the two families indicated that they believed their best chance of obtaining protection was to head for Kathmandu. Arriving at the Nepalese border by bus on July 29 last year, the two families were in Kathmandu by the morning of August 1. “The first thing we did was register with the UN High Commissioner for Refugees office,” Mr Kuruppu said. Several days later the two families – four adults and five children – were able to sell their jewellery and rent a single-room flat on the outskirts of Kathmandu. As the weeks passed, neither Mr Kuruppu nor Mr Athukorala were able to find work, but, according to Mr Kuruppu, they were able to get by mainly on the charity of members of the Kathmandu International Christian Congregation. 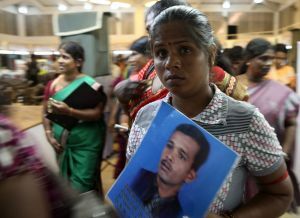 However shortly after both families had received a letter from the UNHCR informing them that they had been recognised as refugees, Mr Kuruppu says his friendship with Mr Athukorala was finally strained beyond repair. Having lived together in such close proximity for so long, it’s hardly surprising. He will now have to meet the $90 a month rent alone, something he feels more confident of doing after he has found a permanent job with a local broadcaster. “We don’t speak Nepalese, and we are not allowed to work here officially, even though we now have official refugee status,” Mr Kuruppu said. He was, however, able to shed more light on the mysterious treasure map that has been the source of all his trouble. He says the true custodian of the treasure map is actually a foundation he co-founded in 2010 to help victims of civil war between Sri Lanka’s majority Sinhalese population and the minority Tamil community. Mr Kuruppu’s main concern today is being able to make ends meet. His children are still not in school, and he still hasn’t received a paycheque from his new employer.